Evergreen Pyrethrum Concentrate botanical insecticide is a broad spectrum insecticide that can be use in OMRI-certified organic production. Delivers fast, effective control of insects, including ants, cockroaches, fleas, and stored product pests. Use in food & non-food areas. Storgard IMM PCO Pheracon II Traps - 25/ctn. For early detection of Indian Meal, Raisin, Tobacco, Almond, and Mediterranean Flour Moths. Dome Trap Khapra Beetle, Warehouse Beetle a trap designed with powerful attractant and to help aid in counting and identifying insects. Carton contains 5 traps/5 lures. Allure Stored Product Moth Kit attracts and traps stored product moths. Can be places throughout food processing plants, food warehouses and in other food processing facilities where stored product insects infestations are suspected. Trece Storgard STGB/MGB Dome Traps - 5 traps for sawtooth grain beetles and merchant grain beetles per kit and 10 kits per case, kairomone attractant for monitoring and identifying pest. 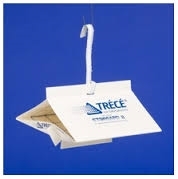 Trece Storgard Webbing Clothes Moth Kit - 6 traps & 6 lures per kit.